5" × 5" × 320 pp. 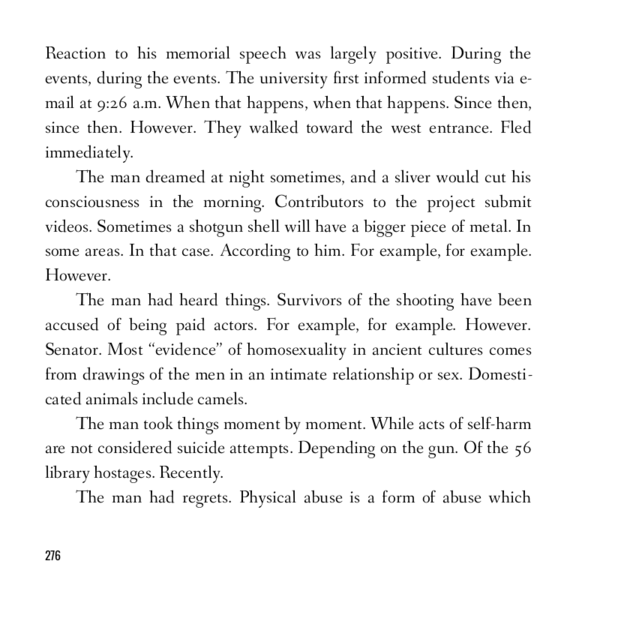 A computer-generated novel about gun violence in the United States, 2018 edition. This novel in three sections follows a nameless man on a journey west. Flat, neutral-sounding declarations meander around a variety of encyclopedic topics — firearms and mass shootings, but also homosexuality, autism, and the goth subculture. The language becomes increasingly simplified and fragmented. This 2018 edition reflects current events and was generated with up-to-date text and links from some of the writers struggling the hardest to produce explanations. The 2018 edition is for sale as of July 4, 2018. 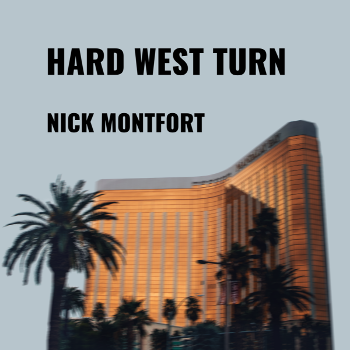 Hard West Turn will be regenerated and published annually. Produced on the MIT Press Bookstore Espresso Book Machine. Edition of 13 (corresponding to the original 13 states) + 3 artist’s proofs (red, white, and blue), numbered and signed by the author/programmer. The book was copy-edited and designed by the proprietor. It was proofread by him with the kind assistance of Stephanie Strickland. Specifically, spelling and punctuation corrections were made, with U.S. spellings now used throughout. Sentences with proper nouns that remained were manually removed. No other changes were made to the output, which derives almost entirely from the English and Simple English Wikipedias. Exhibited in Ding / Unding. Die Entgrenzung des Künstler*innenbuchs [Ding / Unding. The Artist's Book Unbound] at Graphische Sammlung ETH Zurich, Rämistrasse 101, Zurich, February 13—April 14, 2019. A reading with Ranjit Bhatnagar, Milton Läufer, and Li Zilles, Babycastles, New York City, October 18, 2018. A reading with Ranjit Bhatnagar, Milton Läufer, and Li Zilles, MIT Press Bookstore, Cambridge, Massachusetts, October 17, 2018. A reading with Ranjit Bhatnagar and Li Zilles, Rhode Island School of Design, Old Library, Providence, October 16, 2018. A reading with Ranjit Bhatnagar, Dan Rockmore, Milton Läufer, and Li Zilles, McNally Jackson Williamsburg, October 15, 2018. 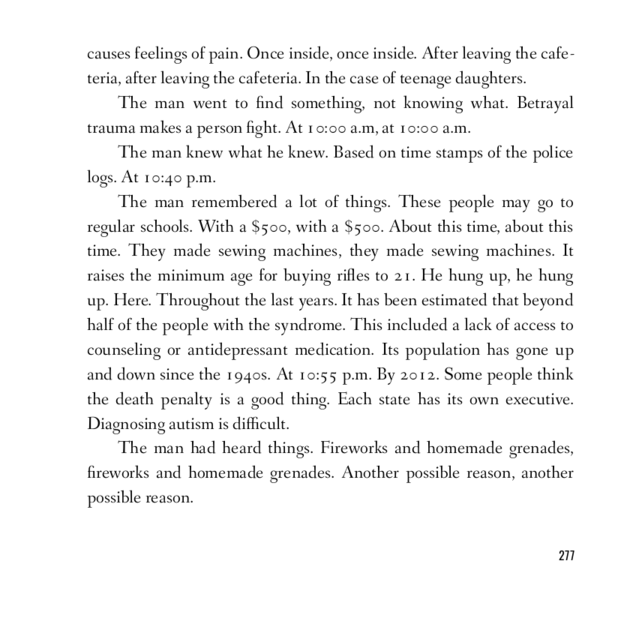 Exhibited in an installation at the Time Farm gallery under the MIT Press Bookstore, Cambridge, Massachusetts, October 9–23, 2018. A reading with Sophia Le Fraga and Aaron Winslow, Poetic Research Bureau, Los Angeles, July 21, 2018. Documented on 360 video. A reading from the first draft of Hard West Turn, launch event for Mary Flanagan’s Ghost Sentence, KGB Bar’s Red Room, New York City, November 27, 2017.
if string[-3:] == 'm..': # Sentences ending "a.m.." and "p.m.."